The dawn of June 24, 2018, Gurumayi Chidvilasananda’s birthday, sparkled with the sounds of bells and the beauty of flames as the morning arati was performed in Shree Muktananda Ashram. Bhagavan Nityananda’s grace and blessings were invoked through this worship. The Birthday Celebration on June 24 would resound with Gurumayi’s laughter–and with the laughter of everyone who had made plans to celebrate this day in Gurumayi’s presence. 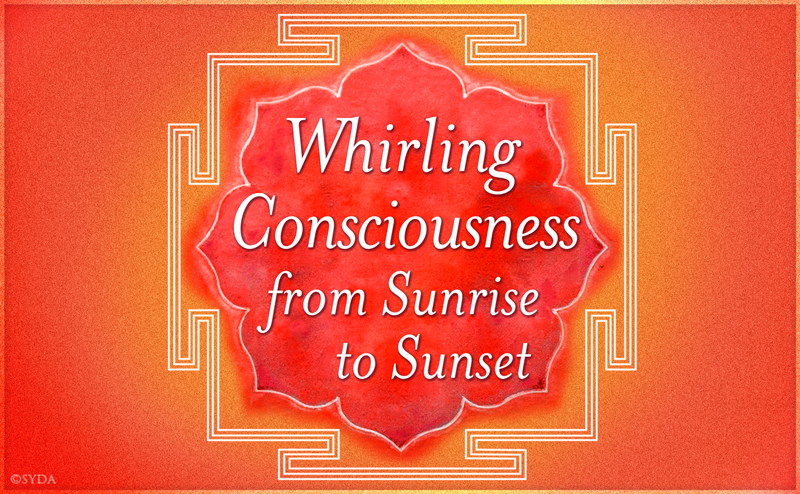 From sunrise to sunset, it was an experience of whirling Consciousness. Here is how the celebration came about. The day before, on June 23, in a satsang in Shri Nilaya, Gurumayi had shared with participants that she had not heard anything about the plans for the birthday. Many Siddha Yogis, including several children, had come to Shree Muktananda Ashram to celebrate with Gurumayi. Gurumayi wanted to know what would be happening. Gurumayi invited the Teachings Council to share their plans for her birthday; the Teachings Council is the group in the SYDA Foundation that is responsible for planning teaching and learning events in Shree Muktananda Ashram as well as in the global Siddha Yoga sangham. The Teachings Council responded readily. However, as they related their plans, it soon became apparent that these plans did not convey the spirit of celebration. They basically stated a few elements that were standard for any teaching and learning event. Gurumayi then invited all the participants to roll up their sleeves and get to work in creating a celebratory satsang that they would like to offer to Gurumayi. Gurumayi did express one wish, which was that there should be a telling of clean jokes. This was so that, on her birthday, everybody would perform one wonderful practice: laughter. This would be a birthday gift that everyone would give to each other on Gurumayi’s behalf. No one needed any extra prompting. This was one request, one seva, for which no one needed a blueprint to follow. In no time, people created their groups and came up with a celebration schedule that was so fit for the day that it inspired Gurumayi to give this title for June 24, 2018: Presenting Laughter! Later on, Gurumayi would say, “It was a celebration by the people, of the people…for Gurumayi!” Everyone was so delighted when they heard this. And—the word spread quickly that something extraordinary had taken place in Shree Muktananda Ashram on Gurumayi’s Birthday. Those elsewhere in the global Siddha Yoga sangham were eager to know what this was. They got a glimpse of what had happened through the photo galleries on the Siddha Yoga path website, but they wanted to know more! They wanted the full story; they yearned to savor the rasa of the day, sip by sip. In light of everyone’s wish, Gurumayi requested that the SYDA Foundation follow the guidance she gave many years ago and take the support of participants to create a narrative of the celebration day. Participants were ecstatic to contribute to writing this account, to share their observations and experiences of all the events that had unfolded on June 24. It was a perfect assignment because, at Gurumayi’s request, they themselves had contributed to designing this wonder-filled day! The Content Department in the SYDA Foundation received everyone’s vignettes and compiled and rendered them into this multipart account. You might therefore think of this account like a prism—a refraction and reflection of various facets and textures and colors of this jubilant celebration. Relish this journey. Learn. Laugh. Walk the path. Contemplate. Become immersed.